Just got home from getting my haircut. Voila! I kept the length but got my bangs trimmed up. I feel more like me again. I cut my feet off. Whoops. Funky tights, eh? Thank you so much Megan for sending these too me. I got lots of complements on them while I was out and at the hair salon. Fun and funky. Going out now to take my recycling back. WHOOO! Eee! The tights look so great with those Vogs. I'm glad you like 'em! I found them in a shop looking for Christmas gifts and thought of you instantly. Those ARE funky tights! 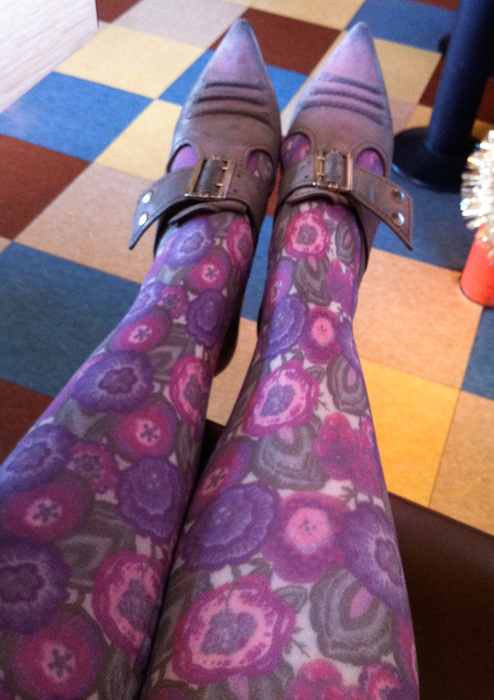 I badly need more patterned tights. Yes, NEED! How could you cut your feet off when you are wearing such cool shoes? Love the shorter fringe, and you look great in purple. I love the tights!! Megan did a great job picking those out for you! They're fantastic!! Purple suits you quite well! Yay, the skants never fail to make me so happy! The floral is excellent with all the purples and your Pilgrims. 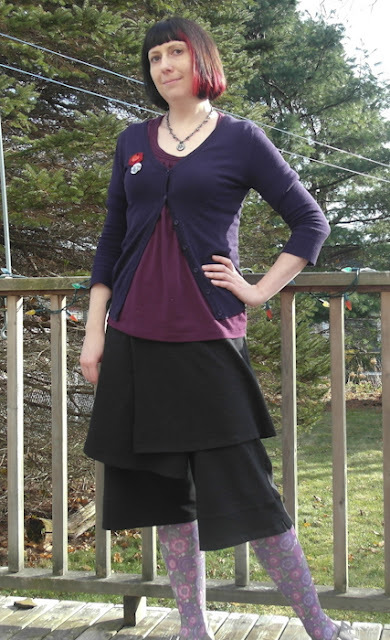 Awesome outfit, and your hair looks really lovely. Oh, I love those Pilgrims...such a great colour.